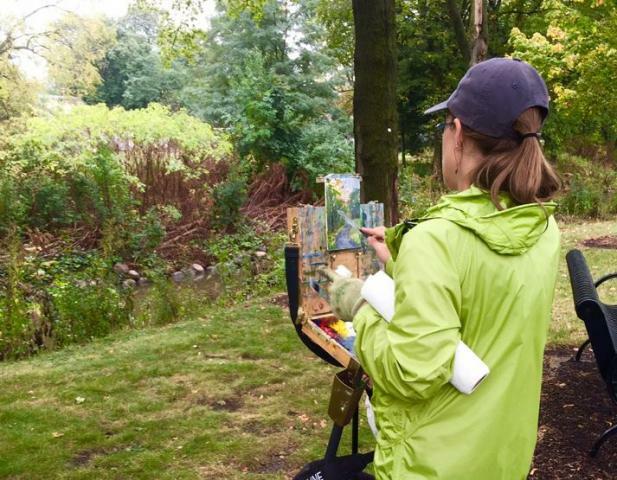 Plein air painting puts the artist in the scene: the painting is created outdoors, on location. Portable easels, lightweight panels or small canvases, and (usually) a limited palette make up the outdoor studio. Artists are challenged by the weather, the changing light, and the unexpected happenings of nature and human activity. Capettini will demonstrate her approach to plein air painting using oils and painting knives. Following the demonstration, artists are invited to join in and capture the historic buildings of Heritage Village and the adjacent I&M Canal. Art appreciators are welcome to come and enjoy the art-making. Appropriate for all ages. Parking on-site. Rain date: Saturday, June 9th at 9:00 a.m.